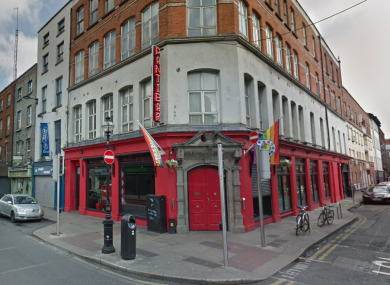 A MAN IN his late teens was arrested last night after a rock containing a homophobic message was thrown through the window of one of Dublin’s most popular LGBT venues. The rock was thrown through the window of Pantibar, owned by activist and performer Panti Bliss, on the city’s Capel Street around 11pm last night. The message translates to “Fairies out of Ireland”. Gardaí are investigating an incident of criminal damage at a bar on Capel Street at 11pm on 29th June. A man in his late teens was arrested near the scene and taken to Store Street Garda Station. He has since been released and a file will be prepared for the DPP. The attack comes as Dublin Pride gets underway. People will begin gathering at St Stephen’s Green South from 11am and a parade will begin moving at 2pm sharp. Email “Man arrested after rock thrown through window of Pantibar”. Feedback on “Man arrested after rock thrown through window of Pantibar”.